Even early on in Peter Davison’s tenure as the Fifth Doctor, many stories have focused on putting his character in rather helpless situations, chaos and death surrounding him as those in positions of authority simply refuse to listen to and trust him. However, ‘Enlightenment’ takes a completely different approach, allowing the Doctor to truly step into the spotlight and become much more defined in the process. ‘Enlightenment’ is filled with quintessentially British cultural observations and quirky notions, and the Fifth Doctor with his cricket garb is absolutely the best incarnation at exploring the issues of social class as he seamlessly blends in with the upper class elitist sailing officers. Indeed, the Eternals directing the lower-class humans through promises of rations and payment while also being willing to sacrifice the humans’ lives with no threat of damage or death to themselves is incredibly powerful and presented in a very accessible manner. This conflict is so effectively realized partially because the Doctor himself is never put into extreme danger, allowing his more cerebral and gentle demeanor to come to the forefont as he can logically tackle the ethical and social debates presented. Davison makes the most of the grand opportunity afforded his character here, and he brings out an unerring forcefulness as he makes his impassioned pleas and demands to the ethereal Eternals he so brashly labels as parasites. Even though the race through space storyline is certainly not unique, the sight of nautical ships from far in Earth’s history traversing the starry skies is a marvelous image and hook, and the Eternals’ quest for their elusive enlightenment provides a strong impetus for the events at hand. ‘Enlightenment’ wisely begins on a small and familiar scale, but it quickly spins into an incredibly grandiose tale that unfolds naturally as small aspects seemingly out of place begin to reveal the much bigger picture. The strong direction and good models and effects which stylistically fit with the Eternals’ views of ephemerals unquestionably bolster the serial, and it’s quite impressive that the limited budget is able to bring out such a refined sense of majesty and vision. Of course, ‘Enlightenment’ also marks the end of the Black Guardian trilogy, though that element of the plot is rather superfluous in an already-strong story. Without ever managing to fully capitalize on the inherent drama of Turlough being recruited to kill the Doctor, ‘Enlightenment’ still does well in offering him some redemption while further developing this distinctly imperfect companion, his cowardice and cynicism a striking contrast to the cheerful Fifth Doctor in particular. The Peter Davison era, perhaps more than at any other time in the classic series, attempted to give meaningful backstories to its companions with varying degrees of success, but the ambition regarding Turlough’s certainly makes his one of the most memorable. In a twentieth season filled with returning faces- some friendly and some not- to celebrate Doctor Who’s lasting success, it’s telling that the innovation and distinct ambition of ‘Enlightenment’ are so refreshing and alluring. 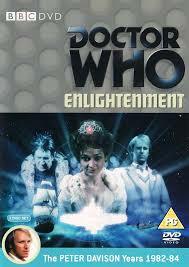 ‘Enlightenment’ is compelling, well-structured, and well-paced, and the terrific performances and direction help to make it one of the very best stories of the Peter Davison era.